Started in 2008, Crowe Shredding has grown to serve greater than 900 local clients. Our success is built on long term customer relationships, in which the client's needs are understood and their expectations are surpassed. As the owner of a business that protects a client's confidential material, you can trust that Crowe Shredding's integrity and responsibility are the cornerstone of all relationships. We are committed to earning and keeping business from service to service. That's the difference between Crowe Shredding and the competition....we don't need a term contract to keep your business! We provide professional, cost effective, secure and environmentally friendly alternatives to our clients. 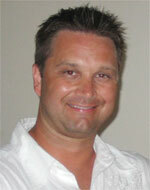 Rhet was raised in Centerville Indiana, and grew up working on a farm, enjoying family, sports and outdoor activities. He graduated from Ball State University in 1996 and carried out his lifelong dream as a Wildlife Biologist for IDNR. A career changing decision was required to move back to Richmond Indiana, where he and his wife Jill, purchased the family farm and started a family with 2 sons, Gabriel and Jacob. After eleven years working in automotive manufacturing management, Rhet welcomed the opportunity to change careers. The confidential document shredding industry was a great opportunity for Rhet to focus his passion to succeed in a business that is built on trust, reliability, and lasting personable relationships. "I truly enjoy building a successful family business that allows for meeting new people and providing a valuable service to our community." "Thanks again for a job well done! The check is in the mail and we will be calling you soon to schedule at our other branches." "Rhet, thank you for participating in our public shred and charitable food drive. The day was a complete success and everyone was impressed by your shred truck and how fast you were able to shred participant's documents. We all enjoyed meeting you and you have built a wonderful business. We look forward to sponsoring another shred event with Crowe Shredding in the next quarter." "Your employees were a delight to work with and we look forward to using your container service. Thanks again for a job well done." "Great job, Rhet! We were all very impressed with your service. We will definitely use your company again in the future." “Crowe Shredding provides a very professional service that services all fourteen of our banking locations. They are professional, polite and always willing to satisfy our every request. They have made every service on time for the past three years and allowed us to realize 15% savings over our past provider." "I wanted to thank you for such a professional job and we appreciate your hard work. We will recommend your service to everyone in the future." "Mr. Crowe, thank you for your continued service. We appreciate your employees friendly and professional attitude when servicing our office."